A man had his face mauled in a grizzly attack, but a pioneering surgery has enabled him to regain his nose and lip. 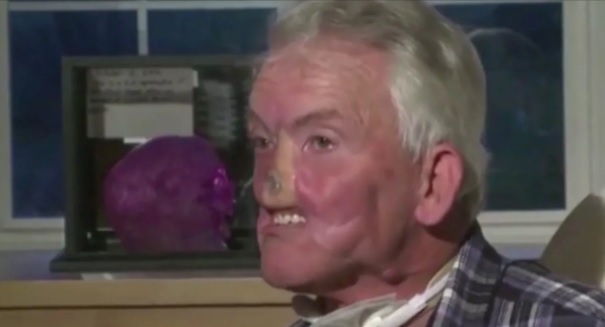 Lee Brooke had his nose and moustache ripped off his face in a grizzly bear attack that left him disfigured, but in a pioneering new surgery, his face is being rebuilt. Brooke, 60, was on a hunting trip and had shot an elk when he realized a bear had decided to take his kill, and then turned on him when he got close. The bear knocked him unconscious, and he woke up to the huge beast towering over him, notcing his nose moustache laying next to him. He knew he had been mauled, and was bleeding profusely, but he managed to grab a knife in his pocket. He got the bear to flee, and then spent an hour in the woods before some help arrived, as his brother in law discovered him. He grabbed his torn-off nose and lip, put them in Brooke’s pocket, and then called 911. After months of reconstructive surgery at the Swedish Medical Center’s Burn and Reconstructive Unit in Colorado, where doctors removed a fibula and some skin from his leg to rebuild his face, reconstructing his nose.